halloween horror story: "the look & the cook"
the invitation came in an email, i was very intrigued + rsvp'd YES. a black limousine picked me + mod*tot up + drove us 3 hours east. we arrived at a deserted rural town next to fields + rail road tracks. the enormous factory sat back from the gated road on a long driveway. we were greeted by a smiling pr person. the driver said he'd wait outside. the pr person took us into a room full of frito lay executives from across the US. they offered us soda + snacks (we don't drink soda, we avoid salty-sugary chips). they each gave us a slide-show talk about the merits of their patented potato + "green" efficient "local" factories spread across the Americas + other countries. they own every part of their product process from the patented GMO seeds, to the fields where they're grown, the train tracks + trucks that bring the potatoes + corn to their factories to be processed by their automated processing line. i asked whether their patented potato was more nutritious, but the answer was: "NO, it's the look & the cook". a shiver ran up my spine. i looked at the executives, they smiled proudly. a woman explained their patented potatoes withstand high temperature cooking without brown spots, so they cook consistently + look good in the bag. when it was time to tour the factory. mod*tot was not allowed to go with us. they are so secretive, they only let a few people per year tour the factory. i put on my hair net + gloves + followed the tour leader. the executives followed me. then i was led to the roof: it was covered with................ Solyndra solar cylinders! 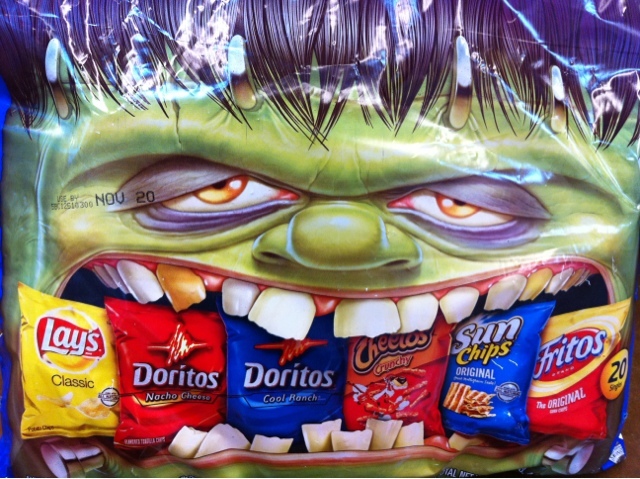 i was sent home with big bags of sun chips: i retained water + bloated!